The Berks History Center is pleased to announce a new acquisition of personal and military artifacts of Captain George W. Durrell to the BHC Museum Collection, donated on March 27. The donated items include a large escutcheon, an NCO sash, an officer’s sash, a Model 1840 Light Cavalry Sabre, as well as personal and military correspondence from Captain George W. Durell. 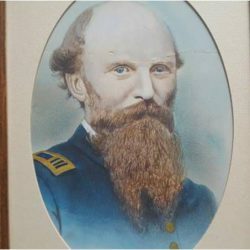 George Durell first gained notoriety in Berks County as the Orderly Sergeant of the Ringgold Light Artillery, the preeminent light artillery company in the Pennsylvania Militia before the Civil War. The Ringgold Light Artillery would later earn greater fame by becoming a member of the First Defenders, which were the first troops to respond to President Lincoln’s call for volunteers at the outbreak of the War of the Rebellion. A watercolor portrait of Durell as Provost Marshal of Berks County and a photo album were also included in the donation. Born in Wilmington, Delaware in 1816, George W. Durell eventually moved to Reading seeking employment with the Philadelphia and Reading Railroad (P&R RR). He was a painter by trade and rose to become superintendent of the P&R RR paint shop. In addition to being a skilled painter, Durell led one of the most celebrated batteries in the Civil War. Captain Durell’s battery was composed mostly of men from Berks County. “These artifacts are of immeasurable value to the understanding of Berks County’s history. This donation will help us learn about an actual Berks Countian who played an important role during our Civil War. ” said Mark Pflum, Civil War historian and leading authority on Berks County’s Civil War artillery units. The Durell artifact collection is now on display in the Berks History Center Museum. The items will be exhibited until the end of June. Durell’s correspondence and photo album will be also available to the general public for research in the Berks History Center Research Library.